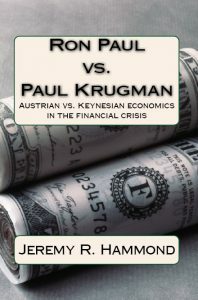 Jeremy R. Hammond, Ron Paul vs. Paul Krugman: Austrian vs. Keynesian economics in the financial crisis (2012). The reader does not have to be highly knowledgeable about the world of economic theory to understand Ron Paul vs. Paul Krugman. 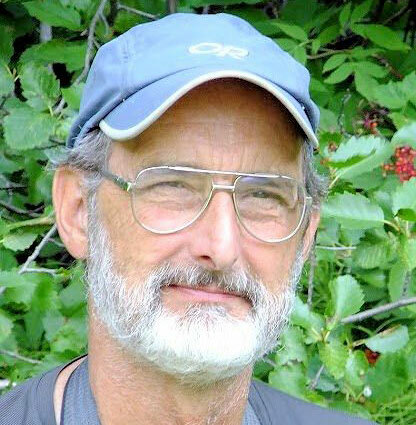 Clearly written, and with an obvious and well supported perspective, the short work highlights some of the aspects of all the political discussions about free markets, government intervention, and how certain authorities—essentially Krugman in this study—are quite willing to change their words to suit their own purposes. Krugman’s main purpose appears to be to avoid accepting any blame for the financial mess that the U.S. and thus the world is currently immersed in. I am not a fan of economics, as the people I normally associate with economics do not appear to be the brightest intellects in the land, and often seemingly lack common sense. This discussion, by leaving out much of the economic jargon, presents a clear case that Ron Paul has it right and has been consistent, and still is consistent, with his views and advocacy for true free market action. There is one big point of emphasis that is made obvious in this comparison of the two protagonists’ positions. It is in the discussion of free markets and what is indicated is the truth of the current U.S. and global economic system: that it is decidedly not a free market system. For all the pundits’ exhortations, for all the political rhetoric, for all the wars for freedom and democracy attached to free markets, it is in essence all a lie. As presented here, not a lie in that free markets cannot work, but a lie in the sense that they simply do not exist in the world today, and probably never truly have. The central point under discussion here is the control by the government through its institutional affiliates of the interest rates. For Krugman, the simplified argument amounted to keeping the interest rates low in order to spur spending, and if that did not work, then lower the rates some more, and so on. Accompanying this intervention were and are the assurances given by the government—both rhetorically and in real financial support—that the financial institutions would be bailed out if the economy turned against them. For those with large amounts of unspent money, this would give license to deal with all kinds of risky financial behaviors. For Ron Paul, his arguments were consistent and have been proven correct. Interest rates, subject to the market and its hopefully balanced demands for spending and saving, for building wealth and saving for the purchases of real goods that build the wealth, should not be held artificially low. Instead they should be allowed to rise and fall as the demands of saving and spending rise and fall. Hammond quotes both figures extensively, comparing their words from one time to another time. In Paul Krugman’s case, it is a long series of changing his story, in one part to avoid responsibility for his part in the financial downturn, and for the other part—it is hard to ascertain—in order to sound like he still knows what is best, or what he is doing is correct. The differences between what he said at one time and says at a later date are numerous and obviously contradictory, and Hammond has no trouble juxtaposing Krugman’s waffling rhetoric. Ron Paul on the other hand is consistent with his message: we do not have free markets and we need to get to them. By controlling the interest rate and controlling and assisting the institutions with rules and bailouts, the free market cannot operate as it should, and by holding the interest rate near zero, we are only setting the economy up for an even bigger downturn in the future. At this point, I can see why Ron Paul will not be the Republican nominee for president—he makes too much sense and the big money boys do not want him taking away their taxpayer financed cash cow. For this very reason he has been sidelined by the corporate media, who initially were distinct and clear in their derision of his efforts. Through the seemingly unending U.S. electoral process of the GOP primaries, he has remained steady to his word and his beliefs while essentially being ignored by those in power who enable the eventual winner. There are few differences between the various U.S. presidents. Before they even make it to the final election run, they have been vetted by the establishment as either suitable to be ‘leader’ or have been sidelined through scandal and exposed ineptitude, or in Ron Paul’s case, by ignoring him. Jeremy Hammond makes it very clear that free markets are what we do not have. His arguments along with Ron Paul’s consistent correct view of what the market manipulations will result in—economic disaster—make the theoretical free market idea appealing. My problem still remains with the reality of what exists today, without much likelihood that it will change in the near future. All the current politicians in the developed countries are extolling the virtues of free markets while trying to corral them behind institutional bailouts, nonsensical policies, and the rhetoric of democracy and freedom coming at the end of a gun barrel or missile or two. Read Ron Paul vs. Paul Krugman for a clear understanding of their positions. Ron Paul’s free market position does away with the institutional supports, the fixed near zero interest rates, and the foreign wars that support the economy. It would be great to try.